Like to write? Love Gilmore Girls? Great! There is a new challenge, called ggirls_las, where you write a fanfic of at least 100 words every two weeks based on a different prompt. Then they get voted on and the person with the least votes is out that week and the person with the most is safe next week. Till you have one author standing who wins! What do you win? A snazzy graphic and a $10 GC to Amazon or Barnes & Noble. You don't even need to be a GREAT writer! I am chasing Trory fanfiction that used to be on the Sweetdreams Website (http://www.sweetdreamsfic.com/troryfic.htm) which of course no longer exists. Chemical Reactions was one of the stories. There were many others but it has been many years since i have read them. If anyone knows what happened to them or if they were the author, i would love to read them again. I was wondering if anyone had Surya's trory fics saved on their computer. It was a long time ago I read them, and they are nowhere to be found online (except for The More Things Change, which is still up on FF.net, but I seem to remember that some more chapters were posted on her site, chapters that weren't posted on FF.net). If anyone has them saved and is willing to send them to me, I would be forever grateful. I'm looking for a fic I read some time ago. Rory went with Paris to Washington after the season 2 finale and they meet Tristan there. Does anyone know which fic this is? It's driving me crazy that I can't find it! ETA: The fic is set during Rory and Paris time in Washington. I'm looking for a Trory fic I read long ago. The bits I can remember is that Christopher was in an accident and passed away. He and Rory used to like to read the Lord of the Rings books together. Tristan comforts Rory and reads to her from the books. If I didn't get the fics mixed up , I think Rory also needed an article of Tristan's clothing to sleep at night. Anyone who knows the title & author of this story please let me know! It's been bugging me real bad. A link to it would also be great! Hi, I finally got around to making a fanfic journal and thought I'd start off by posting for my current favourite ship, Trory. Rory goes to the Chilton high school reunion against her better judgement. She's different now and she's not the only one who's changed. "Tell me what you want?" "You." I didn't see anything in the rules against this, and mods, if I am in the wrong, slap my hand, and it won't happen again. I've created a new LJ community called finalfourwords. It's a 'Gilmore' contest based on what your final four words of the series would be (based on the idea of how ASP had them planned out from the beginning herself). Come check it out to contribute to the fun or cheer at the sidelines. We'd love to have you. Disclaimer: I own nothing, sometimes not even sanity. Mkay? Summary: He wanted her, he wanted this; his happiness lived in her. Distribution: At my site every night by curfew. Any other takers, just let me know. Time Period: Days of Chilton -- 'Run Away, Little Boy' is where it begins. Ickle Word: Schmoopy - (adj) - To be sweet and adorable and cute to the point where it creates an entirely new word to describe it. Song: 'Thanks For the Memories' by Fall Out Boy. Very loosely based on actual lyrics; more based on the overall idea of the song. Beta: carpesomediem -- thanks, darlin'. Author's Note: I had somewhat of a more magnificent piece I worked hard to finish and polish in time. Things didn't work out that way. Here's the consolation entry. I hope it suffices. Dedication: For __undeniiable, who requested a Trory from me eons ago. Pairing: Rory/Tristan... but not exactly romantic. Summary: Rory finds some old letters she'd kept hidden... and tries to come to terms with the fact that they stopped. Abruptly. I used to run a Trory and Narcoleptics fansite called Angelic. It went offline beyond my control. I recently re-launched it and was wondering if you guys would like to submit your Trory fics there. You can send me a link or the fic to trory.web@gmail.com Thanks. 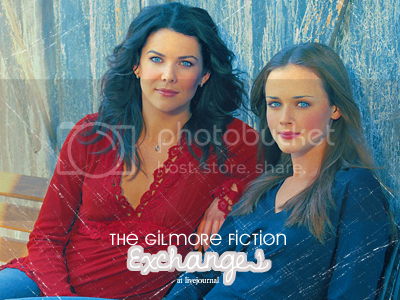 ggficexchange is a community for Gilmore writers of all kinds. It's a fiction exchange where you write a fic for someone and someone else writes a fic for you. That way, everyone's happy. Head on over to ggficexchange for a good writing challenge. elite_ggxchange is the equivalent of ggficexchange only more challenging. Authors must apply before joining and their work will be judged. We do this because there will be a winner at the end of the exchange, crowning one person the best writer of that challenge based on their story. Deadline for applications are August 25, 2007 at 1:00 PM EST. elite_ggxchange is currently accepting applications! This writing community takes after pbfic_exchange2 , a community for swapping fan fiction stories of the Prison Break fandom. The volunteering authors will write and receive a prompt. The prompt is the author’s guideline for writing a piece for another author, and the writer may take it in any form (unless stated otherwise). Now, here’s the catch: You must apply before joining. Your best fan fiction piece (preferably Gilmore Girls, Prison Break or Heroes related) may be linked to (or simply pasted below an lj-cut). Piece, meaning one-shot or chapter of a story. Not everybody will be accepted. It’s an elitist community for a reason: the authors, after the reveal, will be polled. They must vote on their favorite story, and it cannot be his/her own. The winner will receive a banner with the characters/actresses/actors of his/her choice to flaunt. ggficexchange is accepting applications! These are equal to the above. The application is merely a query and you will automatically be part of the Fiction Palooza. Because both communities’ exchanges will begin at the same time, it is recommended that (if you are accepted at elite_ggxchange ) you don’t do both at the same time. It’s preferable you focus on one story and make it great! All this said, I am looking for a banner-maker. Banner-makers will also have to apply. You do not need to participate in the exchange to be a banner-maker. So I hate to have to ask, but I'm desperate! Okay so quite a while ago my computer went haywire, they fixed it but it was never the same and I lost quite a bit of info. Including my all time fave Trory fic, hoping someone can help me. Rory had a son named Ben. Rory lives in New York. Tristan has a daughter named Emma. Meets up with Rory, they fall in love. Paris and Jess are together. They're neighbors at some point. And they (Trory) have a baby named Olivia. loads of thanks in advance! Summary: AU. Sort of a song fic – Trory. I don't remember the name of it. I think it was posted on ff.net and it is still a WIP. It is probably a few years old. Rory is over in Europe, I think. She runs into Tristan, who is running from his father who is trying to make him take over the business, and they end up traveling together. I think there is a train or bus ride where a lady tells the driver to leave and that there isn't anyone left to wait for forcing Tristan and Rory to get stranded. He asks his grandfather for money so his father does know where he is. I think there is a train or bus ride where a lady tells the driver to leave and that there isn't anyone left to wait for forcing Tristan and Rory to get stranded. Well I think that is what happens in it. Hopefully that is enough that someone can help me.